In this section of the Happy Valley web site Tim Boddington has developed a set of pages on the History and Heritage of Bollington, the Happy Valley. Separate subsections are included for People, Families, Mills, Extractive Industries, Manufacturing, Churches, Old Pubs, Houses, Schools and more. Not a lot happened round here for a very long time. The region was shaped by the last ice age, more than 10,000 years ago, and our distinctive hills and valleys were formed by the movement of ice and its subsequent melting. Natural growth would then have taken hold with large areas of trees spread over grass and scrub. Bollington’s boundary was established by 1270 and has remained almost exactly the same ever since. Bollington was once part of Macclesfield forest – not all trees though. 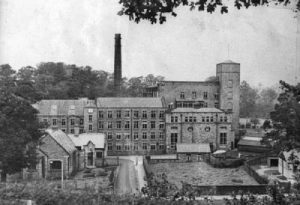 But once the industrial revolution began in the 1760s, just 30 miles away at Arkwright’s Mill in Cromford, Derbyshire, the river Dean from Gin Clough (just above Rainow village on the road to Whaley Bridge) down to Lowerhouse, Bollington, together with the smaller Harrop Brook, suddenly became an important source of power. Power was required to run the industrial machinery, so the valley through what is now Bollington became an important industrial asset, ripe for development. And one of the great things about water power is that you can use it over and over again so long as the river bed keeps falling! Bollington is in the hills so the falls are significant. Downstream from Lowerhouse the ground becomes more level, the river more placid, and provides less opportunity for extracting its energy. The next mill downstream today is Quarry Bank at Styal (NT) , located just beyond where the Dean joins the river Bollin. The history section of the web site concentrates on the history since the start of the industrial revolution, c.1760, with just a few earlier references. 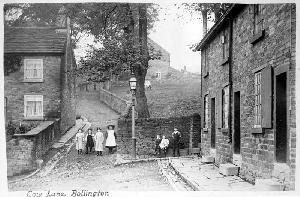 If you would prefer a short history then please look at the Short History of Bollington or, for a longer history of a longer time, you could read Bollington Through the Centuries, a delightful book written in 1934 by the then Vicar of St. John’s Church, Revd. 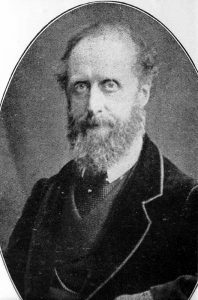 R. Norton Betts. This book is available at the Discovery Centre . In addition there is an extensive bibliography available on the books page. There is a logical juxtaposition of all that we find here today. Once someone decided to build a mill there was a need for stone with which to construct it, so quarries were opened up. Mills and quarries needed labour so cottages were built and roads laid out with the same stone. Homes needed warmth so coal mining developed. People needed the comfort of religion so churches were built throughout the town to welcome a variety of faiths. All of these facets of urbanisation required trade skills – shopkeepers of many kinds, butchers, brewers, publicans, liverymen, farriers, carters, churchmen, cordwainers (cobblers) or cloggers (wooden clogs were very fashionable for mill workers! ), dressmakers, hatters, and so on. Very soon an entirely urban community was developed being provisioned by the surrounding rural community. As time went on other services and skills were introduced, such as schools and teachers, undertakers, printers, chimney sweeps, and even a few policemen. And, of course, every imaginable skill required by the cotton industry was represented here. The Macclesfield Canal came in 1831, followed by the Macclesfield Bollington & Marple Railway (MB&MR) in 1869 – each of these brought further requirements for new skills together with new opportunities for trade and industry. A slightly longer short history can be found on another page. Mills were developed by imaginative entrepreneurs (see the section on mills). They were risky enterprises and several failed. Those that became profitable enabled the mill owners and operators to build their grand houses around the town (see the section on houses) – Ingersley Hall (Gaskell), originally built as a farm house in 1774 before Bollington industry developed, Rock Bank (Swindells), Limefield (Brooke), Waterhouse (Oliver), Oak Bank (Brier), [New] Hollin Hall (Davenport), Mount (Greg), Turner Heath House (Antrobus), Rookery (Antrobus), Endon Hall (Clayton), together with some smaller but none the less significant houses – developing their estates in some cases with landscaped gardens and parks. It is interesting to note that it is our generation (late 20thC, early 21stC) that is enjoying the real benefits of the tree planting of more than a century ago with the fine stands of mature trees we find all around the town today. What will it look like in another century when these trees have gone and all we have left for the future is a town full of scrappy sycamores? It’s just a thought. Some of the best known people of more recent times are recorded in the obituary section. Click here to go to the index page.